To complement our reputation for thought leadership, we are offering a growing list of resources to our clients, friends and colleagues interested in leadership and organizational development. In this detailed overview of accountability and the system of accountability, learn how clarifying the roles of managers and direct reports accelerates the achievement of strategy. In today’s economic reality, unlocking the latent potential of your staff is essential. Failing to do so could waste 25% of your company’s salaries. Put away the engagement surveys and enhanced comp & ben plans. Good organizational structure and process is the foundation of employee engagement, and leadership is the multiplier. The big reward for implementing a Coaching Culture is consistent strategy achievement. It all starts with a conversation between a manager and a direct report. Talent Management systems are often overly HR-centric, ignoring or marginalizing the vital roles of an employee’s Manager and Manager-once-Removed (MoR). 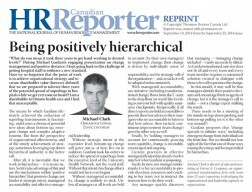 A condensed version of our article, "Accountability: Unleashing Potential through Clarity", appeared in the November 2011 HR Reporter. In it, Julian Chapman writes that holding managers accountable for direct reports keeps everyone focused and engaged as they drive toward strategic vision. A new approach to security could generate savings as well as create a competitive advantage for your business. All that is required is a shift in perspective, and a focus on security risk management. Did you know that Forrest has submitted an Effective Intelligence Wikipedia entry approved by EI founder Jerry Rhodes. We're working with a wiki editor to massage it to wiki standards. In the meantime, please enjoy a whole lot of "Hard Red" and very little "Soft Red" on the theory and practice of Effective Intelligence: ie lots of info, not much packaging. Listen to long time Forrest associate, Dr. Tim Elliott as he talks about his coaching practice and his book “Clarity and Courage: Life as an Improvised Journey”. "Why is it so hard to get work done around here?" The biggest barrier to getting work done is a lack of clear authorities across teams and functions. Did you know that 70% of work in organizations is lateral not vertical? In other words, you and your team rely on peers and other functions for most of the inputs you need to make your outputs. BUT, in these lateral relations, who has the hammer and when do they get to use it? Who has authority over you, and over whom do you have authority? What can you do if you don't have the hammer? How can you clarify authority to reduce frustration and build trust? The fear of upsetting the people and opinions upon which we rely to define and control our world – "anaklesis" – is an enormous source of resistance to change. Let's take the opportunity to dive deeper into the nature of this resistance, and what "cures" are available. Learn perspectives on the issue that you can deploy in your day-to-day deliveries and conversations. 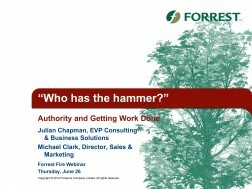 NOTE: This webinar was originally delivered internally solely to Forrest staff. We found the content sufficiently compelling, though, to post it for public consumption. If you have already been introduced to anaklesis, whether or not you are in the Forrest family, you will definitely get new perspectives..
"Clearing the road and stepping on the gas"
"Innovation" is the watchword for organizations in our post-industrial economy. The importance of continuously meeting evolving customer need is matched only by the need to continuously improve the internal policies and procedures necessary to do so.Yet, inside organizations, the road from bright idea to marketplace remains a rocky one. Over our quarter century, we have witnessed among our clients a myriad of barriers to successful innovation. But, 5 firmly occupy the top of the list - and they are all internal. What are those barriers? How are they overcome? And, what can you do to step on the gas? 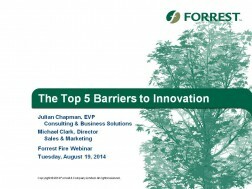 Join Julian Chapman, Forrest's EVP, Consulting & Business Solutions as he takes you for a ride around your top 5 barriers to innovation. "This isn't what I asked for!" Whether in the boardroom or on the frontline, lack of clarity in task assignment is painfully frustrating, not to mention a huge source of misspent organizational effort. But, there is a better way. Join Tony Welsh, Forrest's EVP Consulting & Design, as he teaches you an easy-to-use, 7-step process to harness your intentions for the benefit of yourself, your team, your boss and your organization. Effective task assignment is all about starting with the big picture, moving to the specifics and ending with a question. And that's exactly what we'll do in this entertaining and informative webinar. Don't leave your staff guessing! "A Meeting of the Minds"
"Did anything come out of that meeting?" How often have you heard that? How often have you said that? Gathering with your colleagues has the potential to accelerate the team's work. But, without the means to focus and drive to your goal, meetings are often hijacked by differing perceptions. So, how do you herd a tableful of cats to brainstorm, to share information or to make decisions? Join Tony Welsh, EVP Consulting & Design, as he leads you through an extraordinarily effective and easy-to-use tool to prepare for and lead a great meeting. 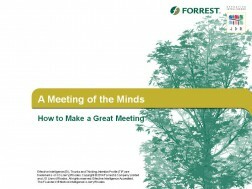 Your attendees will be better prepared, your meeting will stay on track and everyone will contribute more effectively. Brace yourself for: "Wow! A lot came out of that meeting." The fact that you’re reading this indicates that you are being paid to think. But have you been trained to think? How many of us think skillfully? It’s not about knowledge and intelligence. It’s about the mental mechanics of thinking through day-to-day tasks: the repeatable processes of consciously thinking through something. How expert are you at, say, decision making, problem solving and planning? Do you re-invent the wheel each time you think these through, or do you have a tried and true, step-by-step process to get from your thinking to your goal? That’s what Effective Intelligence is all about. Over 150,000 people, worldwide, use the Effective Intelligence model to be more productive every day. Join Tony Welsh, Forrest’s EVP, Design and long-time Effective Intelligence facilitator, as he demonstrates the value of using your head. "Get MoR for your money!" "Managers-once-Removed" - "MoR’s, aka "managers of managers" - are organizational effectiveness resources hiding in plain sight. If you're a manager of direct reports that manage people, or if you're an HR or OD professional, join organizational structure guru, Tony Welsh, as he shows how you can get the most from bosses of bosses. Talent management, cross-functional resourcing and conflict resolution is just the beginning of what your MoRs can do to improve everyday and long-term performance. You have a wealth of technical expertise that you're ready, willing and able to use for the benefit of your organization and the people in it. Yet, you can't seem to convince your colleagues that your idea, plan or process matches their needs and wants. Sound familiar? So, how can you persuade people that they need your help? fore your next effort to convince someone, join Tony Welsh, Forrest's EVP, Design, as he teaches you a robust and easy-to-use, eight-step persuasion and influence process first developed by the Dutch tech giant, Philips. Forrest’s Michael Clark reviews the VUCA presentation to the Strategic Capability Network in May, 2016. Forrest’s Michael Clark reviews Carlos Davidovich’s presentation to the Strategic Capability Network in May, 2016. While knowing that my quick-moving lizard brain is overriding my slow-moving executive brain is gee-whiz interesting, it does not help me overcome “bad” bias. Until neuroscience produces “Unbiazon,” a magic pause and reconsider pill, it remains a shiny ball that only justifies the work of organizational effectiveness, but doesn’t help it. 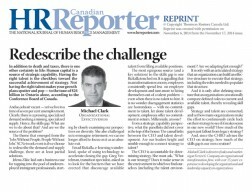 Forrest’s Michael Clark reviews RBC’s presentation to the Strategic Capability Network in April, 2016. Analytics, the darling of our age, has the potential to be the driver of organizational effectiveness. I say “potential” because we are not there yet, and there are serious systemic barriers to overcome. Forrest’s Michael Clark reviews Rogers’ presentation to the Strategic Capability Network in March, 2016. 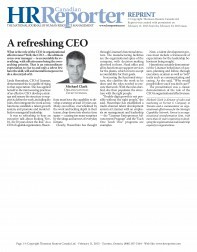 Kudos to Rogers for having the courage to experiment with coaching as a means of redirecting organizational culture to facilitate its three-year strategy to lead the market. At first glance, the focus on a single managerial accountability versus “going a mile wide and an inch deep” is risky. Forrest’s Michael Clark reviews Vince Molinari’s presentation to the Strategic Capability Network in February, 2016. Forrest’s Michael Clark reviews Canlan Ice Sports CEO Joey St Aubin’s presentation to the Strategic Capability Network in January, 2016. 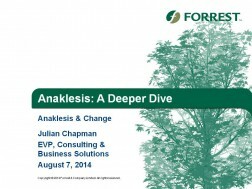 Forrest’s Michael Clark reviews Institute or NeruoLeadeship Director of Research, Josh Davis’ presentation to the Strategic Capability Network in September, 2015. Forrest’s Michael Clark reviews the “The World of Business is International - Are You Equipped to Succeed?” presentation at the Strategic Capability Network in September, 2015. "OE, 1 employee at a time"
Forrest’s Michael Clark reviews the “Ordinary Magic: Using the Science of Resilience to Build Better Organizations” presentation at the Strategic Capability Network in August, 2015. 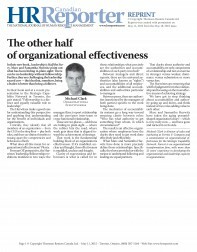 If organizations are the sum of their individuals; what if we drove organizational effectiveness through individual effectiveness? Could many small solutions to many individual problems overcome the inertia of complexity? Could these accumulate to create a sustainable critical mass of positive change that would result in organizational effectiveness from the other direction? Forrest’s Michael Clark reviews the “Academia Meets Corporate Canada” presentation at the Strategic Capability Network in November, 2014. "The Other Half of Organizational Effectiveness"
Forrest’s Michael Clark reviews Marc and Samantha Hurwitz’s presentation of their new book, Leadership is Half the Story to the Strategic Capability Network in May, 2015. Mark and Samantha Hurwitz point out what has been hiding in plain sight: there can be no leadership without followership. Further, they are challenging the leadership sacred cow: that somehow, being a leader and leading is “better than” being a follower or following. Forrest’s Michael Clark reviews Linamar CEO Linda Hasenfratz presentation to the Strategic Capability Network in January, 2015. 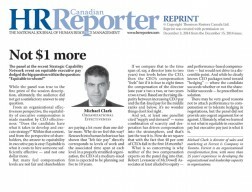 "Effective, and not one dollar more"
Forrest’s Michael Clark reviews the ““What’s Equitable in Executive Pay?”” panel presentation at the Strategic Capability Network in November, 2014. "Re-describe the Challenge, while Challenging Ourselves"
Forrest’s Michael Clark reviews the “Jobs without People, People without Jobs” panel presentation at the Strategic Capability Network in October, 2014. Forrest’s Michael Clark reviews Dr. Michael Gardam’s presentation, “Positively Deviant”, at the Strategic Capability Network in August, 2014. Prior to delivering his presentation "Coaching as the Common Language: Closing the Performance Gap in the Four-generation Workplace" at the 2013 HRPA Conference, Forrest VP Julian Chapman is interviewed by Canadian HR Reporter on the meaning and importance of coaching as part of organizational strategy and culture, and generational transitions. Looking for the cure to organizational pain? 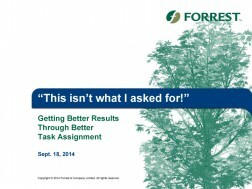 Discover the wide-ranging solutions that Forrest offers, and how we apply them. The Core Leadership Practices: What does it truly mean to be a Manager, and how can we get that here? Learn about the benefits and role of CLP, the most comprehensive leadership framework available, encompassing all behaviours for effective managerial leadership in any organization, in any sector, at any time. We facilitate strategic thinking to clarify, develop, plan and implement your strategy. We then provide clarity on organizational levels and roles and how best to populate them. The Core Leadership Practices (CLP™), the most comprehensive leadership framework available, is the means by which organizations leverage organization-wide managerial leadership to achieve strategy. For over 20 years, Forrest has used its proven executive coaching model with over a thousand executives, coaching them to solve complex issues, leverage strengths and overcome barriers. Break through the barriers to getting work done. Use expert facilitation to harness the power of a group to explore options, resolve issues and get results. Gain valuable insights into yourself and your team and make better decisions faster through the use of a proven thinking model. Improve performance by mastering the skills of universal and tactical processes used by everyone, everyday. Our growing suite of programs immediately enables participants to make their thinking conscious, deliberate and more effective. Take a look at who we are and what we do. An introduction to the Forrest way.